Christian Democratic Union (CDU) delegates offered Chanceller Angela Merkel a standing ovation that lasted almost ten minutes on Monday after a speech in which she called on the party's storied past to offer her vision for the future. Merkel's speech to the party conference was seen as a key test for the Chancellor after months of grumbling and open spats with the CDU's Bavarian allies, the Christian Social Union (CSU) over her refugee policy. With one million refugees now registered on government computer systems, the pressure was on for the Chancellor to impress. And she chose to hark back to the CDU's greatest post-war chancellors to explain her actions, name-checking Konrad Adenauer, who led Germany through its post-1945 reconstruction, and Helmut Kohl, on whose watch the country was finally reunited in 1990. "It's in our country's character to achieve great things," Merkel said. "Germany is a strong country. We've achieved so much. We will manage this," she continued, repeating the famous phrase she first uttered when allowing Syrian refugees into the country from Hungary. "If we really doubt that we can do this, with a view to our European responsibility, our humanitarian responsibility, our responsibility to Germany, we wouldn't be the CDU," she added, explicitly linking the refugee crisis to the party's European and Christian values. The Chancellor won a battle with the right-wing of the CDU in the run-up to the gathering by torpedoing its bid to set a cap on the number of asylum seekers Germany would take in - a proposal she has denounced as immoral and unconstitutional. The compromise text, due to be passed later Monday, instead calls for a "tangible reduction of asylum seekers and refugees". But as well as the kindly face, Merkel was unafraid to take a harder tone, welcoming a massive reduction in asylum seekers from the western Balkan nations since Germany declared those "safe countries of origin". And she went on to say that Germany could "expel [failed asylum seekers] with a friendly face, explaining that we need to concentrate our strength on humanitarian protection". Refugees granted a permit to stay will not be allowed to bring their families to join them in Germany for two years, she added. And she called for more European action to secure the external borders of the Schengen free-movement zone. "We have gladly taken up the advantages of Schengen – free movement, business, student exchanges – but we weren't ready to deal with what happened when free movement was put to the test." In the end, Merkel insisted, "change will continue in the next 25 years inside and outside Germany, whether we want it to or not". "I want Germany in 25 years to remain my Germany, our Germany... a Germany that protects the worth of individuals, in which peace and security are at home, that is a home for people with all their differences." Next to the refugee crisis, all the other issues Merkel wanted to bring up might have seemed insignificant. But she argued that everything from technological innovation to the Paris climate agreement to globalization and even the refugee crisis itself were part of a trend of accelerating change. Merkel's speech opened with a month-by-month tour of the various crises that had broken out in 2015, " a year like I've never experienced". The Chancellor recalled the terror attacks in Paris in January and November, the Ukraine peace negotiations, the Alps plane crash that brought forth "real German-French friendship", the change in EU policy after hundreds of refugees drowned in the Mediterranean, Greece's bailout brinksmanhip, June's G7 conference in Bavaria, and the moment she decided to allow refugees in from Hungary. All of them, she said, had to be dealt with by referring back to the CDU's founding principles. "Those can be our compass," Merkel said. "The idea was an unbelievable idea, a party that finds its impulse in the god-given worth of every human being." 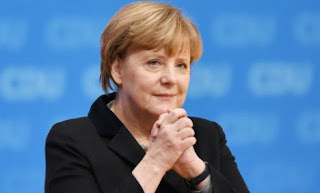 The vision she wanted to get across was of an economically strong Germany, embedded in a prosperous, secure European Union, that was able to build economic and humanitarian bridges all over the world. "The capacity and readiness to change defines our readiness for the future," Merkel said. "It's decisive that we go courageously on the way, with our values and our understanding of the world." The roughly nine-minute-long standing ovation was only interrupted after Merkel returned to the lectern and reminded delegates that "we have work to do". But even before the applause had died down, the consensus was that the speech had put an end to the talk of threats to Merkel's leadership that had appeared in the domestic and international press in recent weeks. "The party is going with her," tweeted ARD journalist Tina Hassel. Her name-checking of those thought to be her potential successors – Finance Minister Wolfgang Schäuble and Defence Minister Ursula von der Leyen – served to reinforce their limited stature as members of team Merkel, rather than serious challengers. And that final admonishment to get back to business fit perfectly into the image the Chancellor was trying to project throughout – of a leader with a bright vision reaching ten, 15 or 25 years into the future, which Germans just had to "roll up their sleeves" and get to work to achieve. Merkel may yet face more resistance from within her own party to some details of her refugee policy. She has effectively said that by going against her, they would be going against the founding fathers and ideals of their party and of modern Germany - and that's a difficult charge to brush off, especially as the CDU continues to lead the polls. Germany is divided roughly down the middle by the refugee issue, with a poll on Friday showing 49 percent opposed Merkel's stance while 47 percent supported it. The CDU has grown jittery as the disaffection has given a boost to the right-wing populist AfD party, which has soared to 10 percent in some polls. "Many traditional voters feel homeless," news weekly Der Spiegel wrote in its current cover story headlined "The Anxious Nation". Nevertheless, the CDU has recovered its footing in the polls after a steep drop in the autumn and is now tallying about 39 percent, just 2.5 points off its 2013 showing in the general election.